In last week’s blog, I talked about the three main elements of what we offer to our customers to make their enterprises intelligent. And promised to add the four end-to-end business scenarios to the equation. They are critical from a business outcome point of view as they can cover more than 70 percent of a company’s value chain. First, take a look at the Lead-to-Cash process. It is one of the key business processes at most companies because it allows us to recognize the business revenue generated within your enterprise. The process captures everything from a customer who has an intention to buy, through the translation into a real opportunity, the opportunity turning into a real code, code turning into a final order, the realization of that order, and finally the invoicing for the customer. Being able to use the customer object as a leading object that goes across that process and to be able to get a 360 degree view on that customer – including experience data (why something is happening) along with the operational data (what is happening, be it in CRM, HR, ERP), is going to be very important and a true differentiating factor against the competition. So, the combination of the C/4HANA customer experience suite, our latest acquisition, Qualtrics, and the S/4HANA core suite will be invaluable elements of this process. The second process is the Total Workforce Management process. It maps to any organization because it’s focused on how to be the most successful with your most valuable resource: your workforce. TWM is about planning, forecasting, and sourcing employees and contingent workers. It’s how you establish the best-in-class HR processes that allow for very simple, intelligent onboarding and offboarding experiences and meaningful learning and talent management for employees. TWM encompasses SAP SuccessFactors and connects to Fieldglass for contingent sourcing but also incorporates our digital core with S/4HANA. Bringing all this together gives you again that 360 degree view of your workforce. Sylvie Otten Sollod gives an excellent account of current workforce management trends and how critical it is to stay up-to-date with your software processes to accompany your employees and contingent workers along the end-to-end HR value chain. The third process is the Source-to-Pay process. It’s about intelligent spend management, sourcing, and procurement. You want to intelligently choose the right suppliers who can deliver the goods in the quality needed, at the right price, at the right time. SAP leads in this process again because we combine our assets into the biggest business network out there with Ariba, combined with our digital core in S/4HANA. Finally, let’s look at the fourth process: Design-to-Operate. This process goes from the planning of an asset, to the design of an asset, to manufacturing this asset, and all the way to how it is delivered to a customer. It doesn’t stop there. You can also monitor and operate that asset and again get that 360 degree view of your asset lifecycle. Watch this video from the Hannover Fair last week to get more insights. How Do We Bring These End-to-End Business Processes to Life? In order to achieve holistic end-to-end user experience, integration, and embedded intelligence throughout these 4 business processes, you need to have a great team, clarity in direction, and a prioritized list of activities and milestones. My team, in collaboration with experts from different technology and business areas across SAP, have been working on building a consistent set of Technology Guidelines with the goal of ensuring out-of-the-box integration, modularity, ease of extension, and consistent experience. Stay tuned – we will roll them out soon. Enterprise Architects have been assigned to all business applications at SAP to work together on end-to-end business process descriptions, modelled along the Industry Reference Architecture (IndRa), and maintained and published centrally in the Enterprise Architecture Designer repository. These business process descriptions go into different levels of detail, including value flow, scenario implementation, software product collaboration, and data flow diagrams. The latter serve as a basis for showing users how data moves between different processes in a system. This will help to define how to process the data, from where, in which frequency, and with which characteristics. 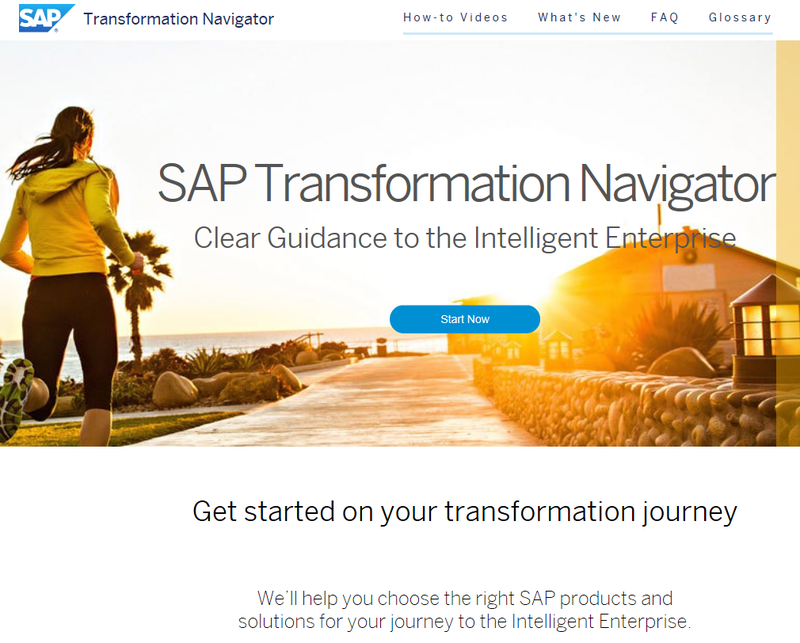 These business process diagrams and associated business capabilities will be made available to customers and partners in the SAP Enterprise Architecture Designer and SAP Transformation Navigator (STN) in order to provide guidance on charting your path to an intelligent enterprise. Additionally, we’re putting a lot of thoughtful effort into Domain Model Alignment (DMA) to ensure that our customers have less replication effort and can consistently design, model and implement business processes across applications. And we are building SAP Cloud Platform with an eye to the future, as a business platform that can serve as a true foundation for future growth. In addition to implementing DMA in the SAP Cloud Platform, we are implementing requirements for aligned APIs and their documentation on SAP API Hub, master data services, automated provisioning, process visibility and mining, event patterns, code lists, integration robustness, field extensibility, and SAP Data Hub to ensure holistic and consistent integration. Check out Anette Asmus’ blog for more insights on what’s happening in terms of integration. As with all human-centered progress, the technology is just a means to the Intelligent Enterprise end. The digital transformation journey also must include a concerted change effort, both within SAP and for a customer’s digital transformation journey. This change must encompass development culture(s) across locations, board areas, and products. This includes integrating and aligning working models, terminology, architectural concepts, testing, validating, deploying, provisioning, and supporting processes. It also requires alignment of the front and back offices, sales, and technology groups to ensure they are focused on the same set of values and guiding principles. Finally, this requires moving from product-driven decisions to a value- and process-driven approach. SAP is undergoing the same efforts as our customers – we are our first customers, on our way to becoming a fully Intelligent Enterprise ourselves. We’re working on replacing our legacy solutions – which brought us roughly 100,000 happy users of SuccessFactors on HANA and Ariba Guided Buying. 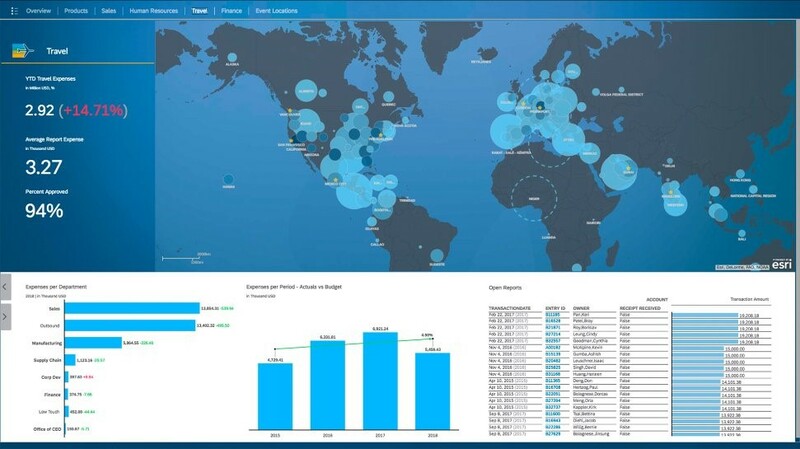 Our CFO runs SAP Digital Boardroom. And these are just some examples of how integration work pays off. I see incredible motivation, experience, and support from all lines of business and at all levels of the organization at SAP working towards our own Intelligent Enterprise goals. And to be crystal clear – the vision is already reality across the complete SAP portfolio. 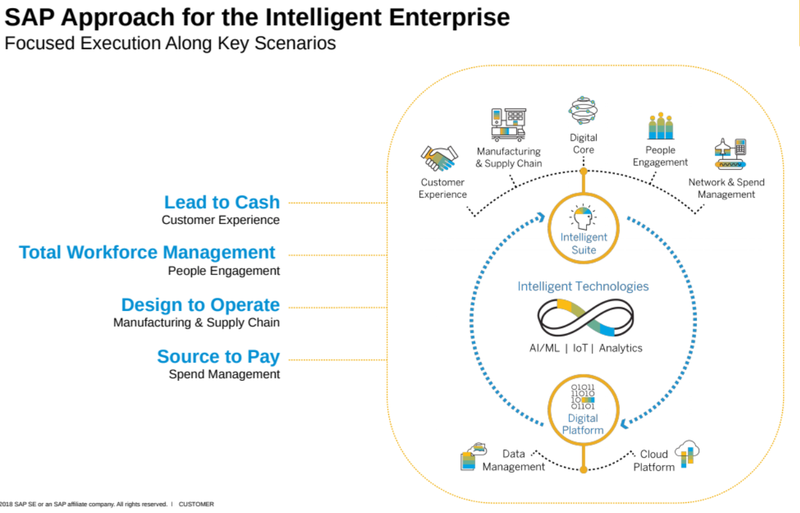 Embedded intelligence is already ready to consume across the entire Intelligent Suite and ready to extend on SAP Cloud Platform or SAP Leonardo Machine Learning Foundation. While there are still things to do and improve – wouldn’t my life be boring if there wasn’t? –we are listening closely to our customers and our community, and working together with everyone who believes in our vision and wants to shape how it comes true. SAP Enterprise Architecture Designer (EAD) is the tool of choice to create end-to-end process models across the different applications. This way, Software Design can grow in sync with the agile development phases. If you want to learn more, there is a free.